Stick with me on this one - it's a quirky story from New Scientist magazine but there are some interesting learnings here for any Knowledge Manager. Henry Astley was the US Expert on frog jumps. Working in a lab in Brown University, Rhode Island, he was studying the biomechanics of jumping in bullfrogs, and how they might leap the maximum distance known to science - which was about 1.3 metres. Then one day his supervisor came into the lab with an article his daughter had found in the Guinness Book of records describing how a bullfrog named Rosie the Ribbeter had jumped a total of 6.55 metres in three jumps, at the Calaveras Jumping Frog Jamboree. This was way in excess of the scientific record, and Astley was amazed. This jamboree, Astley found, was an annual event in Angels Camp California where, inspired by a Mark Twain story, people have been competitively jumping frogs for over 80 years. 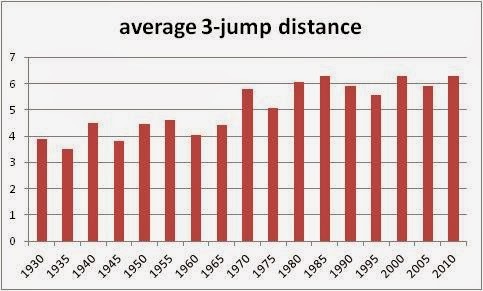 Not only were 58% of the entrants to the competition jumping further than the previous maximum recorded in the scientific literature, the average three-jump distance was on a continuous rising trend (see graph below). This trend is not caused by selective breeding - every frog is captured in the wild, and released after the event - but instead represents the slow and steady acquisition and re-use of knowledge on behalf of the people themselves (the "frog jockeys") through informal lesson-learning. This includes knowledge of which frogs to select (small chest, long legs, big thighs), what temperature to store them at, and how to get them to jump (apparently you lunge at them from behind with your mouth open, trying to give them impression of being a really big fish). This knowledge has built up over the years; slowly because the knowledge is kept a tight secret within frog-jockey families, and steadily because of the competitive pressures of the event itself, driving each family to seek to out-jump last year's results. 1) Pushing the limits of performance is not done in the lab, it's done in the real world. Any Knowledge Management system that derives its knowledge only from the experts in head office and neglects the experience of people out on the front line, may miss the real cutting-edge knowledge. In the case of frog jumping, the real knowledge was in Calaveras County, not in Brown University. So seek to build communities of practitioners, not networks of experts. 2) If you want to improve knowledge of how to do something, you need to measure it, and you need to introduce a real motivation to improve performance, like winning the prize at the annual jamboree. 3) Although there is a cash prize for winning the frog jump, the real incentive seems to be fame, and having your frog honoured in a plaque embedded in the side-walk. Incentives for improvement do not have to be monetary. 4) However if you introduce internal competition with your incentives, getting teams to compete against each other in the way the Frog Jockey families do, then expect performance to improve only very slowly, as knowledge will be kept secret and will leak out only very slowly. Better to incentivise organisational performance, and recognise everyone who shared their knowledge in order to allow the world record to be beaten. These rules will help you use KM to drive performance in your own organisation, in your own key metrics, mush as the frog jockeys have been driving performance since the time of Mark Twain.